At least two people have died from heart attacks while shovelling snow in Buffalo, New York. Every winter, about 100 people in the US die doing this. Why? A study looking at data from 1990 to 2006 by researchers at the US Nationwide Children’s Hospital recorded 1,647 fatalities from cardiac-related injuries associated with shovelling snow. In Canada, these deaths make the news every winter. Cardiologist Barry Franklin, an expert in the hazardous effects of snow removal, believes the number of deaths could be double that. “I believe we lose hundreds of people each year because of this activity,” says Franklin, director of preventative cardiology and cardiac rehabilitation at William Beaumont Hospital, Michigan. His team found that when healthy young men shovelled snow, their heart rate and blood pressure increased more than when they exercised on a treadmill. “Combine this with cold air, which causes arteries to constrict and decrease blood supply, you have a perfect storm for a heart attack,” he says. 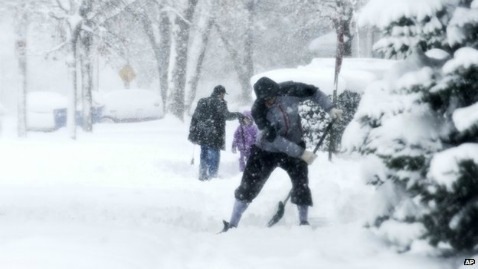 Snow shovelling is particularly strenuous because it uses arm work, which is more taxing than leg work. Straining to move wet and heavy snow is particularly likely to cause a surge in heart rate and blood pressure, Franklin says. Many people hold their breath during the hard work, which also puts a strain on the body. In addition, the prime time for snow clearance is between 6am and 10am which is when circadian fluctuations make us more vulnerable to heart attacks. Franklin considers snow shovelling to be so dangerous that he advises anyone over the age of 55 not to do it. “People at greatest risk are those who are habitually sedentary with known or suspected coronary disease, who go out once a year to clear snow,” he says, adding that smoking and being overweight drastically increase the risk. If you must do it, push rather than lift the snow, dress in layers, take regular breaks indoors and don’t eat or smoke before shovelling, he advises. Using a snow blower is a better option, but there have also been heart attacks recorded in men using blowers, including one fatality in Buffalo on Wednesday. “People don’t have any idea how taxing it is on the heart,” Franklin says.